Your feedback is very important in helping us create the best possible product. To begin, all you need to do is start filling out the questions in the Common App. inline’s tips and hints (along with Coach, the inline feline) will magically appear among the questions as you work. Please complete as much of the Common App core section as you possibly can. You will not be testing the individual college sections in this beta test. We’ve created a Google Form for you to provide feedback. 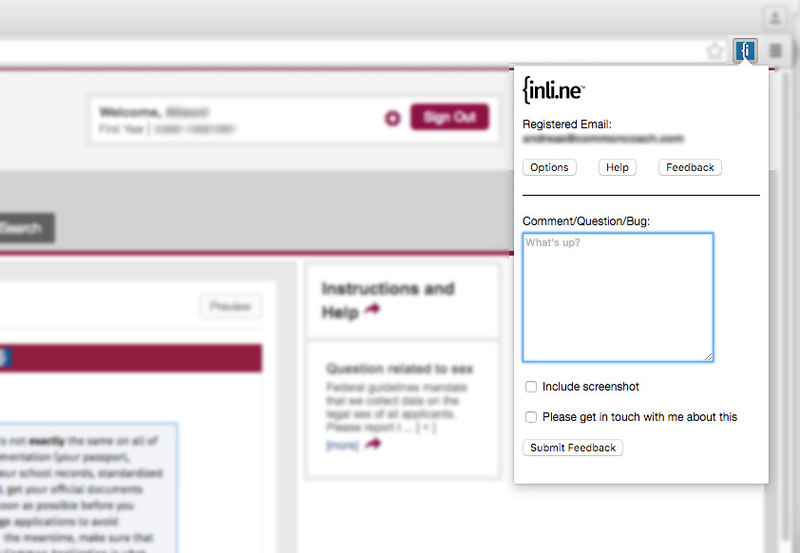 If you’d like to access it while working with inline in the Common App, please click here. It’s important that we have your feedback by July 8th, 2016. Please provide your responses before then so we can send you an invitation code to use inline FOR FREE when it launches. No feedback, no invitation code. Sorry. If you need help while using the product or encounter something you think is odd, click the inline icon at the top of your browser window, then click on “Feedback.” You’ll see a form where you can enter your question and submit a screenshot. We will get back to you right away if it is an urgent issue.